Arthur C. Clarke wrote that "any sufficiently advanced technology is indistinguishable from magic," but he was wrong. It's easy to tell the difference—technology works. For example, "remote-viewing" mentalists claim they can see events far away, yet they fail every test. In fact, remote viewing is simple: It's called TV. Another example that recently circulated online was a fake video of someone charging his iPhone by jamming the end of a USB cable into an onion. How do I know it was fake? First, you need contacts made of two different metals, and second, you can't get enough voltage out of a single vegetable. 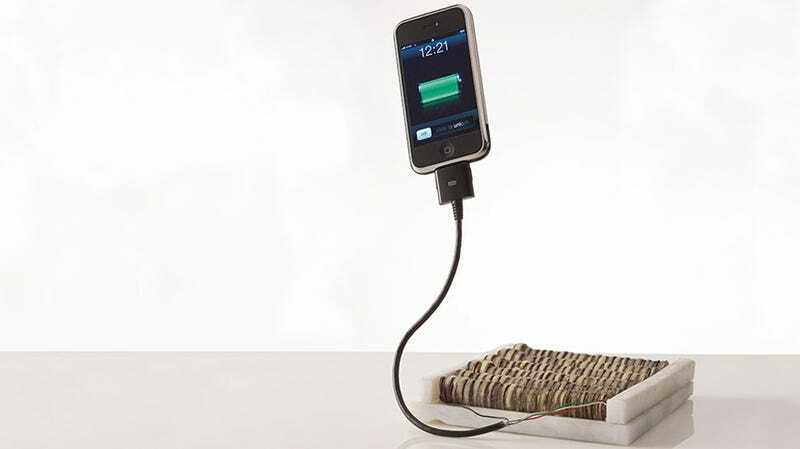 What makes the ruse so disappointing is that it is possible to charge an iPhone this way, if you do it right. Theodore Gray, the author of Popular Science's monthly column, "Gray Matter," is convinced that when kids and adults are introduced to science in its most exciting form, they, too, will get hooked. 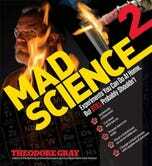 In his newest book Mad Science2: Experiments You Can Do At Home, But Still Probably Shouldn't, Gray wants to spark that curiosity with visually spectacular experiments that illustrate the principles, the beauty, and the power of science. A regulation vegetable battery, made by sticking strips of zinc and copper into a potato, generates about half a volt. The electricity comes from the oxidation of zinc; the vegetable is just an elecrolyte (conductive barrier), and the copper completes the circuit. Stacking alternating layers of vegetables, zinc, and copper is like wiring batteries in series, each set adding its voltage to the total. After some 10 volts' worth of teary-eyed onion peeling, I decided to switch to apples using a fruit corer to cut out the apple rods and a cheese slicer to cut them into disks. Pennies with the copper plating sanded off on one side made a handy source of copper and zinc layers in one. About 150 of these, arranged into six parallel batteries of 25 apple/zinc/copper layers each, yielded enough power to charge an iPhone, but only for about a second. (Much larger zinc plates and whole slices of apple would have provided more power for longer.) Around 200 of the layers went into one three-foot long apple battery, delivering much higher voltage. I was able to create a visible, and potentially fatal, spark with this battery. Yes, in the right configuration, you can electrocute yourself with an apple. This was one of the most involved demonstrations I've done, due to the need to produce a couple hundred half-sanded pennies. Post-1982 pennies are made of copper-plated zinc, so if you sand off the copper plating on one side of them, and combine them with solid copper pre-1982 pennies, you have both metals needed to create a battery. I mounted a short iron water pipe, whose inside diameter was just about the same as a penny, up against a small vertical belt sander, leaving a gap between the end of the pipe and the sanding belt that was just a bit thinner than a penny. Then I filled the pipe with a stack of pennies, and pressed them up against the running belt with a plunger. Each penny in turn was sanded down until it was thin enough to fit through the gap, at which point the moving belt threw the penny out of the machine, allowing the next one to advance into position. It worked surprisingly well as an automatic penny sander, plopping out a sanded penny every few seconds. I first thought of using onions because I figured I could core them with a fruit coring tool (basically a very thin-walled metal tube with a sharpened edge, which you can use to cut plugs out of fruits), and then the layers would separate into lots of individual disks. Unfortunately onion didn't work very well, I think becasue each layer has a sort of membrane on one side that doesn't conduct electricity very well. So I switched to using apples instead, and had to manually slice the cores into disks. Real Danger Alert: This experiment could damage your iPhone if done improperly. In his new book, Mad Science2: Experiments You Can Do At Home, But Still Probably Shouldn't, science enthusiast Theodore Gray illustrates the awesome power of science with illuminating behind-the-scenes tours of the potential of the world around us. His (often dangerous) experiments are sure to capture the imaginations of students and anyone interested in science or just plain old cool stuff.